My class this month for the Copics coloring was the technique of coloring so it looks like an impression...you don't see the lines of the stamp. This is a digital stamp Beccy Muir, new at Sparkle N Sprinkle. To start with you print the image off the computer in a light gray scale. Then unlike the typical way of coloring with light to dark, start with dark to define the lines, because they do disappear as you start to color! Then you can go in and add the middle color and the lightest. The main thing you have to remember is that the colors you choose need to have more contrast. 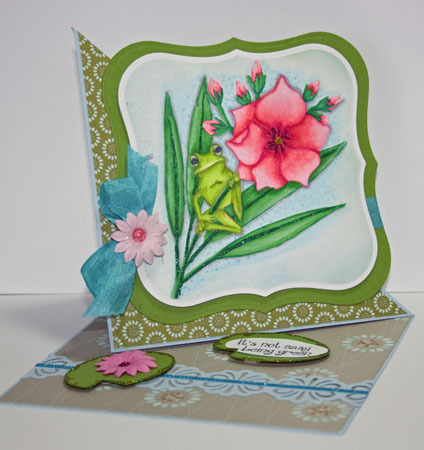 Like on the frog I used YG00, 01, 03, 25, and YG63. The YG63 was far enough away from the others to give a good contrasting line, so you can see the folds in his legs without the stamp line. Then for my card I decided to do the twisted easel card....I hadn't done one of those yet. I used the Grand Nestibilities in my Grand Calibur. Of course I had to add glitter!! 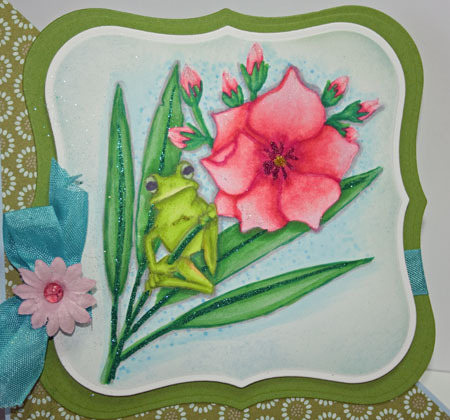 I used the Brushable Glue and the Cloud Nine Velvet on the flowers and buds, Later Gator was used on the leaves, and I used just a bitty bit of the Laua on the frog. For the center of the flower I used the Frosted Carmine and Goldenrod. For the lily pads I brushed the glue on the edges and used the Laua. All the glitters are of course from Sparkle N Sprinkle. 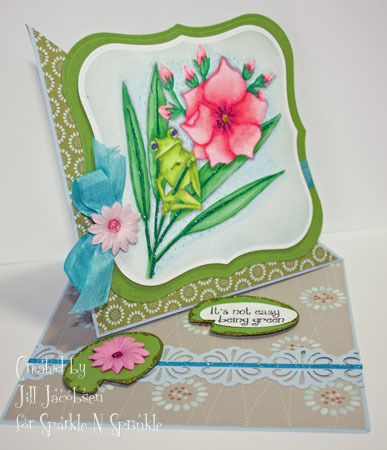 Great project Jill, your card is fabulous! I really like how you've coloured it using the no-line technique, you managed to get some great depth in there. I love the twisted easel card too... I've yet to make one of these but it's on my list! I like that coloring method - and finally some other way to use those digis!! Your coloring worked really well Jill. That little frog is precious! Too bad he doesn't like being green - it really suites him! How cute, Jill - beautiful colors, and I like the technique a lot! Can hardly wait for our stamp set release! Fabulous easel card and coloring technique. This is beautiful, Jill! Love the coloring and the color combination! Cute easel design too! So bright and cheery! I have been wanting to try this coloring method for awhile. Love it! Great technique and the coloring is awesome!! You really did a great job with that technique - the finished image is just beautiful! !